A massive Snow storm is about to hit the Cornwall Ontario area with over 30cm of snow Tuesday with another 10 or so expected Wednesday. Temperatures will warm up from our current -15c Tuesday morning to near the zero mark. Morning is the time to stock up if you haven’t already. We’re expecting smaller loads of snow, under 5CM for Thursday and Friday as well as the storm front passes through our area. 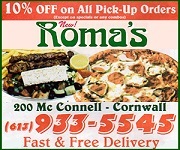 What a great time to order pizza from Roma’s in Cornwall! We will be updating during the day so please refresh this page! Not only are buses cancelled today, but schools are also closed. Snow will begin Tuesday afternoon and become more intense Tuesday night. Easterly winds gusting up to 60 km/h will also combine with the freshly fallen snow to create blowing snow. Total snowfall amounts of 30 to 40 cm are likely before the snow tapers off Wednesday afternoon. Rapidly accumulating snow will make travel difficult. Visibility will be suddenly reduced to near zero at times in heavy snow and blowing snow. Poor weather conditions may contribute to transportation delays. If visibility is reduced while driving, slow down, watch for tail lights ahead and be prepared to stop. Tuesday February 12, 2019 – All transportation is cancelled today due to an impending winter storm beginning today and bringing significant accumulations of snow and blowing winds. Safe travels. Snowfall amounts of 30 to 40 cm and blowing snow today into Wednesday. Snow at times heavy will begin this afternoon and continue into Wednesday. Easterly winds gusting up to 60 km/h may cause near zero visibility in blowing snow. Pretty simple actually. We live in Canada. This is called winter. Deal with it!! Back in the 60’s and 70’s these amounts were normal. Have weather forecasters turned us into a bunch of ill prepared Canadians? I can recall back in the 1950s era as well as the 60s and taking my toboggan and sliding down the hills. We had snow that would go up to the roof tops sometimes. This is nothing anymore as a snowfall and the government talks stupid about global warming when all the time it is a natural phenomena and they just want to tax us all to death. Government is the culprit. It is snowing, its snowing, where is my toboggan, where are the hills to slide down. Those were the good days folks and I always think about the 50s, 60s and 70s era. Those were the days. That reminds me of a WHITE CHRISTMAS MOVIE. We had fun as kids and kids today don’t know about real fun. Where is global warming – it is only a scam done by the GOUBERMENT. You should see the condition of my street and some other streets here in Ottawa. It is like a child did the work it is that bad. Maybe someone got on top of the plow stoned drunk that is how bad it is. Driving through that was like we were horseback riding up and down. The roads here are so treacherous (the side streets is what I mean) and someone had to be literally drunk or drugged or both. I remember the big storm in 71. The worst one yet. And the impact of the ice storm had on us, as we had the electric stack from our house bend like a paper straw. We were out of power for close to 2 weeks. It’s no wonder I dislike winter but now at my age, I hate it even more. Stay safe to all, and watch out for ice under the snow. “Natural phenomena! !” Seriously?? Do some research in what has happened weather wise in the last 20 years. This is no natural phenomena or part of a regular cycle. I just went on the toilet paper of record and I cant stop laughing at wanting to build some structure of WELCOME TO CORNWALL at the US/CAN bridge area and Cornwall Island. We used to welcome people into Cornwall by the atrocious stink of Domtar, Courthaulds and ICI. Now those old relics are only reminders of days gone by. All gone elsewhere like what is happening to General Motors today.